Act 47 is a state oversight program for “financially distressed” cities in Pennsylvania. The state tries to help cities turn around their finances and operations. The name comes from the Municipalities Financial Recovery Act (Act 47 of 1987). What’s the history of Act 47? Pittsburgh has been “financially distressed” for 10 years. The plan that the mayor and city council are currently considering will guide the city from 2014 through 2018.
Who prepares the five-year plan on the state's behalf? The two state supervisors are the Intergovernmental Cooperation Authority and the Act 47 coordinators made up of financial advisors Public Financial Management and the law firm Eckert Seamans. What authority does the plan have? The Act 47 plan acts as a set of recommendations. But, if the city ignores the recommendations, the Intergovernmental Cooperation Authority can withhold all or part of the the city’s gaming revenue, as it did last year. 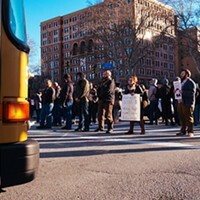 Pittsburgh City Council is expected to discuss the issue on Wednesday, June 18; the plan must be passed by June 30. What are the five things you should know about the current plan? 1) The Act 47 plan recommends that property taxes rise 5.5 percent next year. In 2012, Allegheny County was ordered to conduct a reassessment of all real estate. Property values in Pittsburgh increased by 48 percent and the property tax rate, called the millage, was cut by 30 percent. Ideally, the increased property values should’ve cancelled out the rate cut to produce the same tax revenue for the city. It didn’t. In 2013, the city collected almost $7 million less in property taxes than it did before the reassessment. 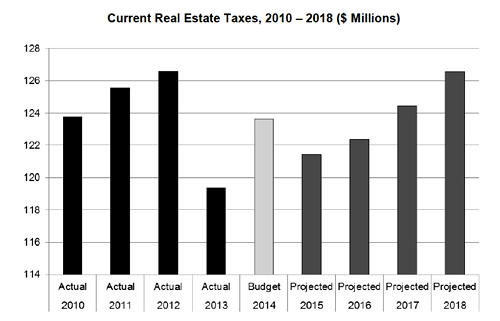 It seems likely that the city also will fall roughly $3 million short of the $123.6 million in property taxes it expects to collect this year, according to Act 47 projections. To correct that nearly $7 million difference, the Act 47 team wants the city to raise property taxes by 5.5 percent. 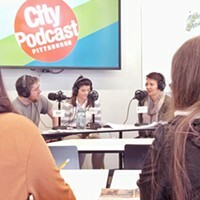 On WESA’s radio show Essential Pittsburgh, Peduto said Wednesday he thinks property-tax increases will be part of the final Act 47 plan. An increase of 5.5 percent would make the city’s property tax rate for 2015 about $797 per $100,000 of assessed value, an increase of about $41 a year. 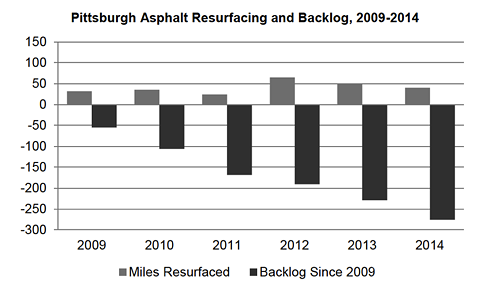 2) Pittsburgh’s roads and bridges won’t get better anytime soon. As part of analyzing the city’s investments, the Act 47 team looked at our bridges and roads. 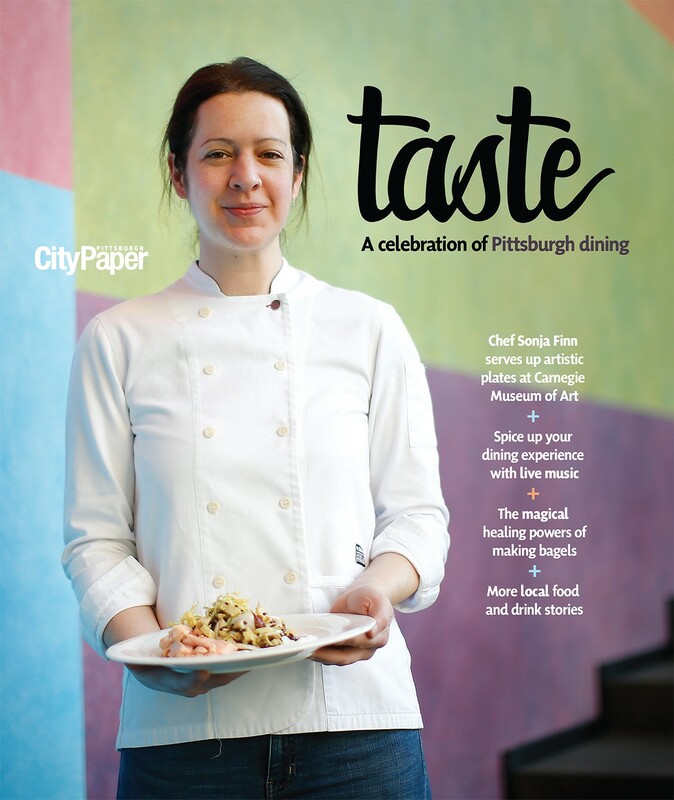 If you’ve driven around Pittsburgh for more than a minute, their findings are not surprising. The city rates the condition of a road using a scale called Overall Condition Index, which goes from 0 to 100. Measured in square yards of asphalt, 56 percent of the city’s roads rated 0 out of 100, the lowest possible score, according to a Public Works report provided to the Act 47 team. Three-fourths of the city’s roads were rated “Very Poor,” the worst category, by scoring from 0-24 on the scale. Asphalt paving has a useful life of 8 to 10 years, according to the Director of Public Works, which would mean, in an ideal world, the city should fix a tenth of its streets each year, or 86 linear miles. 3) The city could save money by only using its bonds for long-term projects. The Act 47 team critiqued the city’s practice of purchasing vehicles with money from its capital budget. The city’s capital budget is funded in part by municipal bonds, which are long-term loans that ask investors for money in return for their money back plus a small interest rate. Let’s say our sample municipal bond lasts 20 years. If the city uses that money to repair a bridge, with a useful lifespan of 50 years, it pays for the bridge improvement over 20 years and then gets an additional 30 years of benefits at no cost. If the city buys police vehicles, with a useful lifespan of two to 10 years, it continues to pay interest on the cars for 10 years with no benefit to the city if the police department no longer uses the cars. By using capital funds, vehicles cost the city more than they should in the long run. 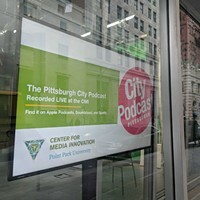 4) The city’s record keeping and technology needs to be overhauled. - The Act 47 team said that most cities have an inventory of all city assets and their condition. Pittsburgh, it found, may not. - The Pittsburgh Bureau of Fire reports its fire data to the federal National Fire Incident Reporting System database. Sometimes, the fire department can’t access the system and has to record the information on paper and wait to reconnect. 5) The city needs to put more money in savings — both in its own account, and for its retirees. Even though that was the city’s plan, it was left with no bond money for capital projects this year. To compensate, the city transferred $25 million from its savings account, known as the reserve fund, to fund capital projects. The Act 47 team uses the Government Finance Officers Association standard of having two months of reserves to fully fund the government, which is 16.7 percent of general-fund revenues. Before the transfer, the city was doing well saving its money. It accumulated a reserve of $86 million, or 17.7 percent of revenue — above the ideal threshold. After using $25 million from the reserve fund for capital projects and $3.6 million on severance packages, the reserve fund has $55 million, just above the minimum threshold of 10 percent set by the Act 47 team. The city’s pension situation has improved, as you see in the chart below. However, it is still underfunded, when compared with the rest of the nation. The current problem with the pension funds is the methodology that determines the city’s minimum payment. The city calculates its yearly minimum payment on a 40-year schedule instead of 30 years. It’s like signing a 40-year mortgage instead of one that’s 30 years — you’d have smaller payments because you’re paying off the house over a longer period of time. But, the Act 47 plan says, at that rate, the pension won’t be fully funded by 2037. The current system also assumes a rate of return on the unfunded portion of the pension is too high, according to the Act 47 report. If the city adopts the minimum proposed by the plan, which puts them back on a 30-year schedule, the city would need to contribute an additional $11.5 million to the pension funds next year. Reach Eric Holmberg at 412-315-0266 or at eholmberg@publicsource.org.